15 of the Best (and Most Offbeat) Attractions in Maine! Maine is known for its lobster, L.L. Bean, and a stunning coastline. But, it is also home to some pretty weird stuff. Maine has a giant Paul Bunyan, a desert, and the world’s largest blueberry. So, if you’re feeling adventurous, hop in the car and take a road trip to find some of Maine’s unusual attractions. Here are our 15 favorites. 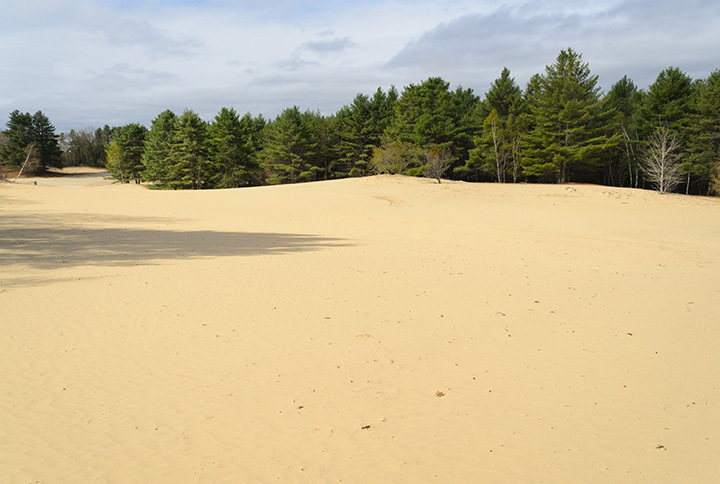 When you think of Maine, the desert is probably the last thing you think about, but Maine does have a small desert in Freeport. This strange attraction has been welcoming curious guests since 1925. The desert was formed by glacial movement over 11,000 years ago during the last Ice Age. Don’t forget to take a photo with the giant camel. Bangor is home to some pretty interesting people and history. Bangor claims to be the birthplace of Paul Bunyan and what better way to show people than a 31-foot tall Paul Bunyan statute. The statute was donated by New York-based builders, Messmoor & Damon, on Bangor’s 150th anniversary in 1959. Paul Bunyan now happily stands in front of the Bangor Civic Center. Famous horror author, Stephen King, calls Bangor home. Known for his spooky books and movies, like “The Shinning” and “Carrie,” his historic Victorian home is very fitting of his style. His wrought-iron gate is covered with black bats. Maine is the largest producer of blueberries in the United States. Drive down Route 1 in the summer and you’ll see no shortage of little farm stands selling blueberries. Opened in 2001 by blueberry farmers, Dell and Marie Emerson, you’ll find everything blueberry from scones to ice cream to blueberry jam. Located in the new Thompson’s Point development, the International Cryptozoology Museum is the one kind in the world. Open six days a week, you can explore the world of hidden or unknown animals like Bigfoot and sea serpents. Outside of the flagship L.L. Bean store in Freeport is the 16-foot tall L.L. Bean boot. Founded in 1912 by Leon Leonwood Bean, L.L. Bean has been manufacturing the famous duck boot for over 100 years. Often sold out, the giant L.L. Bean boot symbolizes the success of the company over the years. Located on charming Peaks Island, the Umbrella Cover Museum was started in 1996 by musician and Maine native, Nancy Hoffman. The museum is home to over 700 covers from over 44 countries in all shapes and sizes. The museum has even been recognized by the Guinness Book of World Records as the largest umbrella cover collection in the world. Founded in 1939 by rail enthusiasts, the Seashore Trolley Museum is the largest electric railway museum in the world. For a small entrance fee, you can take a ride or two on one of the historic trolleys and roam around the large property to see trolleys from the U.S., Canada, Australia, Japan, and more. Coastal town, Jonesport, is home to the Maine Coast Sardine Museum, which honors the area’s long history with sardine fishing and canning. Mainers have been fishing and canning sardines since 1870s. In 1900 there was over 75 plants in operation in Maine. The museum was opened in 2005 by Ronnie and Mary Peabody who collected sardine items off eBay. No Maine road trip is complete without stopping at the famous World Traveler Signpost featuring international city names that was small towns in Maine. Within 25 miles of the signpost, you can visit Norway, Denmark, Sweden, and Paris. Maine has a moose population of over 30,000, but it only has one flying moose. The “Legend of the Flying Moose” is an old Abenaquis Native American legend that has been passed down for generations. Today, the old legend is a large wooden statue with golden wings. Maine has a long logging past, especially in the deep pine forests of the northwest. Before the 1900s, loggers would send fallen logs down the river to lumber mills. However, the rivers did not flow the right direction between Eagle Lake and Chamberlain Lake. During the winter of 1901, men hauled parts to construct the Eagle Lake Tramway. The tramway ran for eight years carrying logs from the woods to the lower legs. Several of the steam engines are still located in the rural woods around Eagle Lake. The last hand-crank phone system in the United States stopped cranking in Woodstock in 1983. To commemorate that faithful day that convert the town into the 20th century, the town unveiled the largest telephone at Remembrance Park in 2008. Moxie is Maine’s official soda. Moxie was created as a medicine in 1876 by Dr. Augustin Thompson. It’s still a popular soft drink in Maine, but it’s definitely an acquired taste for many. The Moxie Museum is located inside the Kennebec Fruit Co. general store. The small museum houses signs, toys, and old cans. Built in honor of Maine’s long fishing history, Big Jim the Fisherman has been watching over the people of Prospect Harbor for over 40 years. Big Jim was originally wood, but when his pants blew off in a storm in the 1980s, Big Jim got metal pants. He used to promote the Stinson Canning Company, but now holds a lobster trap.